Peter and Nick are back from Rio and Challenge Bibendum. The first day of the Challenge had low-emission urban vehicles, intercity cars and long-haul utility vehicles taking part in on-road rallys. The Aurora solar racing car led the intercity course of 300 km, climbing from sea level in Rio to over 1000 m in the mountains near Petropolis, and beyond. The Aurora web site has more details. Advanced ICE engines. How will advanced ICE vehicles contribute to meeting the CO2 emission targets? Sustainable biofuels. How to achieve a 20% market share in transportation by 2020 with sustainable biofuels? Electric vehicles. How to meet a 10 to 15% market share of battery, fuel cell and plug-in hybrid vehicles by 2020? Efficient and safe urban transportation. How will ITS improve the situation? Safety requirements for lighter cars. Can cars be both light and safe? Economics of energy sources and CO2 emissions in the transportation sector. Public and private sector commitment and contribution to reducing work-related road traffic fatalities by 2020. The era of cheap oil is over. Transport is at the heart of the energy security and climate change debate, and needs transformation. There is a positive ‘business case’ for a transformation in the transportation sector. There is a need for carbon market mechanisms as well as regulatory measures to accelerate this transformation. Major tasks for policy makers include better urban planning, facilitating behavioural changes, and eliminating subsidies on fossil fuels. There were over 100 vehicles available for the ride-and-drive sessions. Most of the cars were similar in size and weight to conventional cars. 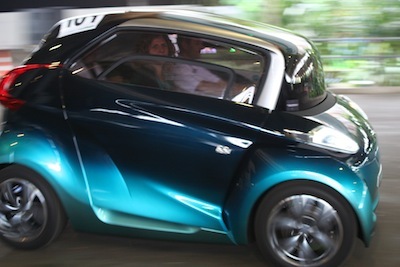 A notable exception was the Peugeot BB1, a small 4-seater concept vehicle that is a cross between a car and two scooters. 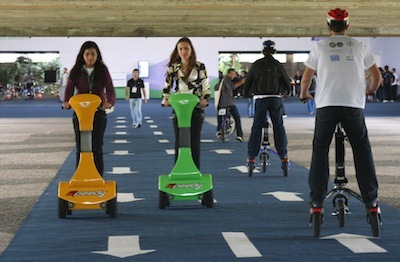 Another highlight was the electric personal transporters, including Segways, electric-assist bicycles, the 4-wheeled Vilco Speedy, and the Trikke Tribred. The Trikke was particularly impressive: fast, manoeuvrable, stable, lightweight, compact, and fun. As someone at the conference noted, you can’t achieve mobility by giving everyone a car. The challenge will be to integrate vehicles such as these, and Trev, into urban transportation. It is a pity that none of the smaller vehicles for very local transport have thought to include at least an option to add pedals or levers for the occupant to assist the electric motor and this extend its range whilst offering the opportunity to take exercise. There is already too much illhealth and obesity without making it easy for the user to avoid all exercise! Challenge Bibendum also featured electric-assist bicycles, which are of course ideal for local trips, and have greater range and speed than the other personal transporters.